Some European Union nations are beginning to impose border controls and checks in an effort to cope with the influx of immigrants from Syria, Iraq, Afghanistan and Eritrea. Germany announced that It would place checks on its border with Austria. Shortly after, Austria, Slovakia and the Netherlands announced that they would also be tightening border controls. 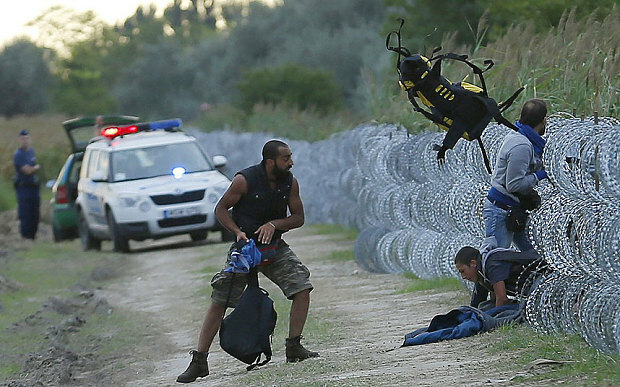 Hungary is also moving ahead with its own border controls by midnight. The Hungarian plan includes completing a fence along the border with Serbia and stricter measures for dealing with illegal immigrants going into effect. The current situation stems from Germany welcoming the refugees with open arms and agreeing to accept a large number. Perhaps the decision was made as a way to get other EU nations to do more for the refugees. As time goes on, though, the apathetic responses of other EU members remain unchanged. So now Germany finds itself in an awkward and not entirely unfamiliar position. It can either come out of this situation appearing indecisive or as attempting to strong arm its EU neighbors into taking actions they really do not want to take. This afternoon EU ministers are holding an emergency session in Brussels to try and work out a comprehensive, coordinated plan to deal with the influx of migrants. No concrete results have appeared yet. Central and Eastern European nations are balking at plans to accept fixed quotas of migrants. As it faces its largest humanitarian crisis in decades, Europe has not yet come together in putting together a plan to contend with the waves of refugees and asylum seekers. The Schengen Agreement, signed in 1985, was designed to assure passport-free movement between EU nations. The recent moves to impose border controls are allowed, however, only for temporary time allotments and in extreme circumstances. A permanent solution needs to be found soon. Otherwise, the future of a border-free Europe will be uncertain. Much like the Greece Debt Crisis, this latest challenge to the European Union seems to be doing little more than eroding the power of the EU.